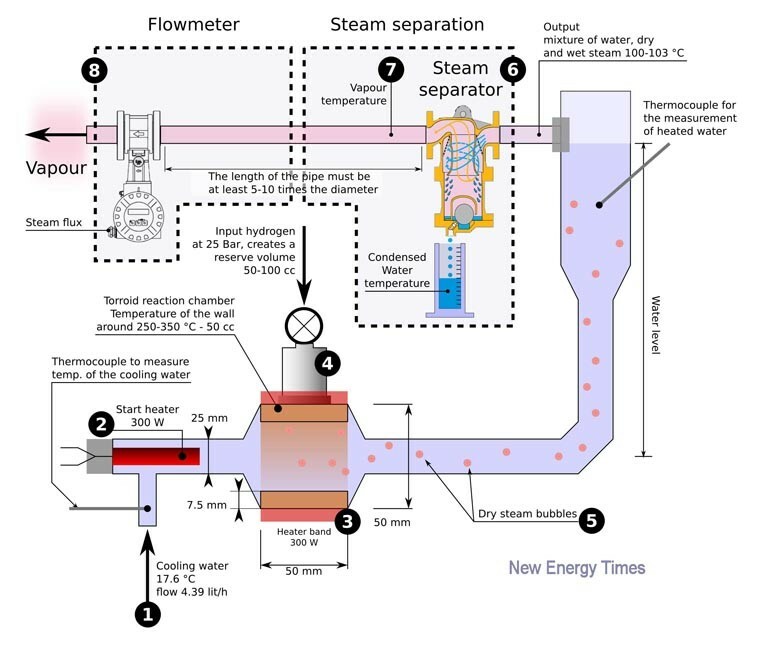 This diagram shows an effective method of measuring the power and, over time, energy of steam output from a device. Performing such measurements requires properly determining steam dryness. With knowledge of the precise steam dryness, we can make precise calculations of the energy capacity of steam. The method requires the separation of condensed water from vaporized water. The volume of the condensed water is measured, and the flux of dry steam vapor is measured. Analysis of the dryness of steam is very complex and requires expensive equipment. For example, instruments with a tolerance of 1%-0.1% will cost $10,000-$20,000 and require careful calibration and tuning. For a simple determination of the thermal power of the Andrea Rossi apparatus, instruments with a tolerance of 15%-10% are sufficient to work with the method of separation of dry steam from the wet steam and then measure the quantities separately. The measuring devices allow the separation of vapor from the droplets; the water exiting the separator can be measured, and then you can get a good tolerance (10%-15%) of the quality of the dry steam. The flow meter allows you to know the volume of steam that must correspond to the difference between the volume of water entering the device under test and the volume of water leaving the separator. 2. Initial resistor used to heat water in order to accelerate the temperature rise. 3. Main resistor used to heat the powder contained in the toroidal chamber. The power of the heater should be a few hundred watts, probably sufficient to heat the chamber on the outside, about 250-350°C. 4. Hydrogen is admitted into high-pressure toroidal chamber. 5. Probable vapor bubbles that have formed because of high temperature reached within the toroidal chamber. 6. The output of steam (wet and dry) is conveyed to a steam separator in order to eliminate the wet steam and obtain only dry steam. For proper verification, measuring the amount of water formed from the condensation of wet steam is necessary. 7. Connection pipe, long enough (5-10 diameters) to stabilize the flow of dry steam and allow proper flow measurement. 8. The flow meter allows the measurement of the volumetric flow of steam and the pressure of the mass of steam flowing in a certain period. Replacing the flow meter with a condenser is possible in order to measure simply the amount of condensed water, which corresponds in mass to the amount of dry steam produced. The method described is not precise, but it clarifies the basic method for measuring the dryness of the steam. First, you must remove the wet steam part. Second, you must measure the dry steam part in some way. For example, measuring the flow volume, pressure and steam temperature or, alternatively, performing calorimetry by condensing all the dry steam. Conversely, if you do not want to know the dryness of steam, another method is to perform calorimetry by condensing all the steam, both dry and wet. Rossi and his team did not use any such method to measure steam output. This failure of methodology is in addition to their failure to use a correct device to measure steam quality. They used a device to measure humidity in air, not liquid in water vapor. The author of this report has a degree in mechanical engineering. He works as a computer consultant, specifically as an advanced technology adviser, particularly in the renewable-energy sector. He has asked to remain anonymous. We agreed because we have confirmed his identity, we consider his information useful, and Rossi has recently publicly threatened and attempted to intimidate several qualified critics.